TrackChecker is an accessible piece of software that can help you track the path of your packages and parcels you’ve sent by mail through the entire world. The application can be especially useful if you own an online store as it lets you keep your buyers up to date with the route of their packages. It’s possible to add events to your track, such as the shipping date and monitor how many days it takes for the package to be delivered. 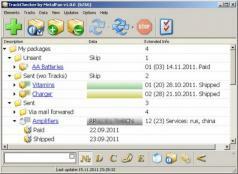 TrackChecker supports shipment tracking for more than 270 mail services from countries all over the world. You can also use the app to monitor multiple parcels simultaneously and mark the ones that were delivered.